Shri Shashi Tharoor, is a well-known Indian English writer, scholar and international civil servant. He was born in London on March 1956 to father, a newspaper executive and mother a housewife, with their roots in Palakkad, a town in Kerala, India. Tharoor mostly grew up in India did his schooling and under graduation in cities such as Bombay, Calcutta and Delhi. He completed his honors degree in History from the prestigious St. Stephen's College in Delhi and won a scholarship to Tufts University in Boston. As a student he took part in debates, quiz contests and also tried his hand in theatre. In the mid 1970's, he went to the United States and acquired two master's degrees and a Ph.D. in Diplomacy from the Fletcher School of Law & Diplomacy at Tufts University, all by the age of twenty-two. Tharoor joined the United Nations in May 1978 in the office of the U.N. High Commissioner for Refugees (UNHCR) in Geneva and has been with the organisation since then. He became the head of UNHCR Singapore office (1981-1984) at the peak of the Vietnamese "boat people" crisis. Then he served as Special Assistant to the Under-Secretary-General for Peacekeeping Operations from 1989 to1996 at UN headquarters in New York, towards the end of the term from 1991 to 1996, he led the team responsible for peacekeeping operations in the former Yugoslavia. He served as the Executive Assistant to UN Secretary General Kofi Annan (1997-1998) and as the Director of Communications and Special projects in the office of the Secretary-General from 1998 to 2001. In January 2001, he was appointed as interim head of the Department of Public Information (DPI) by Kofi Annan, and after a year and a half was confirmed as the Under-Secretary-General for Communications and Public Information of the United Nations. In this capacity, he is responsible for the communication strategy, enhancing the image and effectiveness of the organisation. In 2003, the Secretary-General appointed him United Nations Coordinator for Multilingualism. In 2006, he was the official candidate of India for the succession to United Nations Secretary-General Kofi Annan, and came second out of seven official candidates in the race. Tharoor served as the UN Under-Secretary General for Communications and Public Information between June 2002 and February 2007. Dr. Tharoor, in addition to a variety of other activities in his private life, is Chairman of Dubai-based Afras Ventures. He is also the Joint Chairman of UNSICAD (United Nations Simulation International Conference at Abu Dhabi and Dubai), the World Summit to be held in the United Arab Emirates in June 2008. 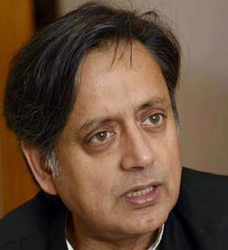 As a journalist, Tharoor has written many articles, short stories, literary reviews and commentaries in such publications as the New York Times, the Washington Post, the International Herald Tribune, the Times of India, the Indian Express, and Foreign Affairs. As a writer, he is very much an Indian expatriate. Shashi Tharoor has explored the diversity of culture in his native India. By exploring the themes of India's past and its relevance to the future, he has produced both works of fiction and nonfiction. He is the winner of several journalism and literary awards, including Commonwealth Writers' prize. In 1998, the Association of Indians in America (AIA) and the Network of Indian Professionals (NetIP) awarded him the Excelsior Award for Excellence in Literature. He was named by the World Economic forum in Davos as a Global Leader of Tomorrow. He received the honorary degree of Doctor of Letters in International Affairs from the University of Puget Sound in May 2000. Mr. Tharoor is also the author of several books, including 'Reasons of State' (1982), a scholarly study of Indian foreign policy; 'The Great Indian Novel (1989)', a modern ironic adaptation of the 2000-year-old Indian epic 'Mahabharata' which is narrated from a 20th century viewpoint; 'The Five-Dollar Smile & Other Stories' (1990); a second novel, 'Show Business' (1992) filmed in 1994 under the title 'Bollywood' which is a satire on the Indian film industry, which received a front-page accolade from The New York Times Book Review; 'India: From Midnight to the Millennium' (1997), published on the 50th anniversary of India's independence; 'Riot. A Love Story'(2001) which is about a married American government official who have a secret love affair and 'Nehru, the Invention of India'. He has also published a collection of short stories. In January 2009, Tharoor was awarded the Zakir Hussain Memorial "Pride of India" Award. He was presented with the Hakim Khan Sur Award for National Integration by the Maharana of Udaipur on March 15, 2009. On 19 March 2009 Tharoor was declared as the Indian National Congress candidate of the Trivandrum constituency in Kerala for the General Elections in 2009. Tharoor will be contesting against P. Ramachandran Nair of CPM and P. K. Krishna Das of Bharathiya Janata Party (BJP). On the personal front, he has separated from his journalist wife Tilottama who lives with their twin sons, Ishaan and Kanishk. Though Shashi Tharoor has been out of India since he was a teenager, he retains a strong attachment to his Indian roots. This versatile personality now lives in New York, balancing his career at the UN as well as his life as an author with equal brilliance and ease.